The 1942 Warner Brothers movie Casablanca has so many iconic lines of dialogue that we’re spoilt for choice when it comes to studying them. “Of all the gin joints, in all the towns, in all the world, she walks into mine.” We could start there. We could round up the usual suspects and play it again. It could be the beginning of a beautiful friendship. This film is a dialogue banquet. And much of it is deliciously ambiguous. People talk in circles in Casablanca. They don’t say what they mean. It’s not safe for people to say what they mean. Not politically. Not emotionally. Instead, much of the dialogue is written to be opaque. No one quite knows what other people will do or say in any given situation. It’s one of the film’s strengths. Here’s the plot. Our hero Rick (played by Humphrey Bogart) is an expat American who owns a gambling-den/bar in Casablanca. Heroine Ilsa (Ingrid Bergman) is an old flame of Rick’s who turns up on his doorstep alongside her resistance-fighter husband. Ilsa and her husband need to flee to America. Rick is the only one who can help them, but he won’t–at least not initially. You see, Ilsa’s not just any old flame, she’s THE old flame. The one who betrayed him, broke his heart and ruined him for all other women. Rick’s bitter (and beautifully lit in this scene, in more ways than one). As a romance writer and reader, I know Rick’s type. He’s worldly, cynical, jaded, morally bankrupt … and utterly at the mercy of his emotions when it comes to the woman he loves. Bogie doubles down on Rick’s emotional vulnerability and proceeds to break hearts. If you’re after a scene by scene breakdown of the film, try Robert McKee’s story seminar. In it he likens Rick to America and Rick’s bar to a miniature U.N.. At the start of the story, Rick “sticks his neck out for no man”, symbolizing the U.S. not getting involved in WWII. By the end of the film he’s chosen to support the allied war effort and has stuck his neck out for a woman. Yes, that woman. The one he puts on a plane to America, with her husband. The woman he maybe, possibly, probably (Oh, hell, I don’t know. Do you know?) loves. RICK: — Last night we said a great many things. You said I was to do the thinking for both of us. Well, I’ve done a lot of it since then and it all adds up to one thing. You’re getting on that plane with Victor where you belong. RICK: — You’ve got to listen to me. Do you have any idea what you’d have to look forward to if you stayed here? Nine chances out of ten we’d both wind up in a concentration camp. Isn’t that true, Louis? Louis Renault countersigns the papers. RENAULT: I’m afraid Major Strasser would insist. RICK: I’m saying it because it’s true. Inside of us we both know you belong with Victor. You’re part of his work, the thing that keeps him going. If that plane leaves the ground and you’re not with him, you’ll regret it. RICK: Maybe not today, maybe not tomorrow, but soon, and for the rest of your life. RICK: We’ll always have Paris. We didn’t have, we’d lost it, until you came to Casablanca. We got it back last night. ILSA: And I said I would never leave you. 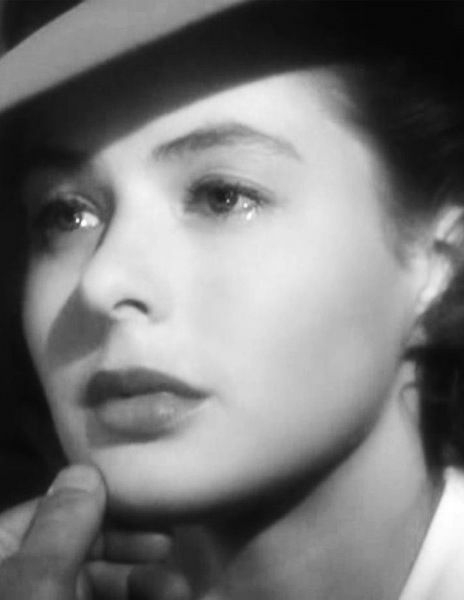 Ilsa’s eyes well up with tears. Rick puts his hand to her chin and raises her face to meet his own. I love this line. I’m baffled by it. Smitten with it. It’s Rick, in all his glorious ambiguity. Maybe that’s why it works. Is it a toast? There are drinks in his hand the first time he says it. Is it a poker term? Yup. There’s a story about how this line first came about. It wasn’t scripted, it was a Bogie ad-lib. Bogie was teaching Bergman how to play poker in their downtime, so the story goes. One of the poker terms he used was “here’s looking at you”, meaning “it’s time to show the cards in your hand.” Bogie said it during one of his early romantic flashback scenes with Bergman and the line stayed. It became a signature line, loaded with subtext. Is it a declaration of love? Does it mean “See you round?”? Does Rick really see Ilsa as a kid? Rick says “Here’s looking at you, kid” three times to Ilsa over the course of the story, but does his perception of her ever change? Does he ever really see Ilsa properly? He doesn’t at first. He falls in love with a woman he barely knows. But here, at the end of the film, Rick knows far more about Ilse and the reasons behind the choices she’s made. He sees her now. He sees how she can have love in her heart for both her husband and for him. Ilsa doesn’t know which man to choose so she asks Rick to choose the way forward for all of them. So he does. He puts Ilsa and her husband on the plane to America and then walks nobly off into the night with Louis, former head of French police, presumably to join the resistance fighters and do good deeds. Love! Sacrifice! Redemption! Bravo, Rick, you big hero. You finally stopped looking at Ilsa. Look at me, look at me instead! As for me, I stopped looking at Ilsa long before she got on that plane. As gorgeous, complex and conflicted as she was, she was never my romantic ideal. I’m still looking for Rick. If you’ve stuck with the post this far, I’ve been waxing lyrical about film dialogue on the first day of every month for a couple of months now. I’m calling it a craft building exercise (as opposed to frivolous procrastination–which it also is). So far I’ve covered dialogue from “Love Actually” (here’s the link) and “Romancing The Stone” (link here). Next month? I’m not sure whic film to cover. The Princess Bride? Bringing Up Baby? Any suggestions? Back to Casablanca. What’s your favourite quote? Your favourite scene? And does anyone feel like singing La Marseillaise? Days of Wine and Roses!. A lesson in subtext! Loved this post, Kelly! “Here’s looking at you, kid,” — I think it’s their own personal, private, intimate couple-code. It’s partly an “I love you” the way the tough guy can say it without being mushy, and that only the two of them understand. But more than that, it also refers back to that card game — a kind of “be who you are, go on and win” that carries the weight of their past together. As you say, it’s opaque, and weighty, and unforgettable. I like your take on the line, Anne. Especially the ‘be who you are, go on and win’. I always felt sad for her because of the no-win situation she was in. And cross with her too, when she put it on Rick to decide for all of them. You know, I’ve never really watched Casablanca that much. Maybe twice. Am thinking I need to again. If we get to vote for your next lyrical waxation I vote for The Princess Bride. And not just because its one of my fav films but because Bringing Up Baby makes me want to blow up the television. I know I’m the lone outlyer with this film but I found it irritating as hell. Overacted and silly. I’ve never watched Bringing Up Baby. I bought it and have it here and have no idea what I’ll think when I do. The Princess Bride, on the other hand … that one’s a favourite.